Here's a way to get use of used Christmas cards again. Talk about great recycling! Save your cards that are mailed to you year to year. Find all the cute and beautiful cards and cut out the parts you like the best. 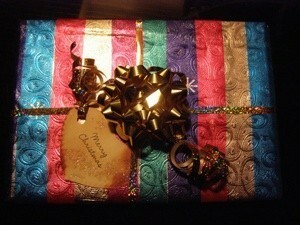 You can cut anything you want out of the cards and use those as gift tags on your presents. After cutting out the images I like, I might use pinking sheers or scrapbooking scissors or just regular scissors. Then I sometimes punch a hole with hole punchers and run a ribbon from my decorative display on the package through the hole and tie it on. The flip side will be for the TO and FROM part. Note in the photo how nice it looks. Sometimes I just tape them on. Endless possibilities and it saves you from having to buy package tags! I also make tags from last year's xmas cards. I use different templates - my favorite is in the shape of a xmas ornament. I get so many free address labels that I've begun to throw away the ones I don't like. If I started mailing two letters a day for the rest of my life, I don't think I'd use up the ones I have now. At Christmas, some of them come with pretty To/From gift tags. Between those and the ones that sometimes come in women's magazines and those I bought on sale after Christmas, years ago, I will probably never use the ones I've got. One frugal thing we've done is to cut way down on our gift list. We only exchange with each other and our son and daughter-in-law. It ruffled a few feathers with extended family, but they got over it. We all have more than we need anyway. And, of course, if we ever have grandkids, we'll spoil them. I always buy next year's cards after Christmas (Half-Price Books is a great place), and this year, I noticed that I was finally, I'm talking years, running out of wrapping paper that I'd bought on sale, years and years ago. I also hit after-Christmas sales for next-year's stocking stuffers. Pier 1 is a great place for that. I do this also with Christmas cards using the fancy scissors to make a decorative edge. Then I found some inexpensive Christmas stickers and put them on also for decoration, better than the bought tags! Great idea! I do this as well, I learned it from my mom. I also save tissue paper and bows and ribbons... I haven't had to buy them in years!